The partial reports filtering out of Damascus indicate that the large-scale terrorist attack carried out Tuesday night, April 27, in the al Maza diplomatic quarter of the Syrian capital - a simultaneous car bomb, machine gun, grenade, rocket assault on several targets that set UN offices on fire and singled out the Canadian embassy – has brought the encroaching global terror warfront dangerously close to Israel. Earlier on the same day, the new Saudi network leader, Abdulaziz al-Muqrin, on a newly-released audio tape threatened fiercer than ever attacks this year against “the Jews, the Americans and the Crusaders.” He promised that Saudi Arabia would not be able to protect US interests. But “the Jews” topped his list of targets. To subscribe to DEBKA-Net-Weekly click HERE . The Damascus assault by mixed bombing-shooting teams recalls al Qaeda’s pattern of attack in most of the strikes it has carried out in the Saudi capital of Riyadh since May 2003. If al Qaeda was indeed behind the Damascus raid, its Tehran-based commanders are clearly in the process of further stretching their warfront across the Middle East into a fresh theatre, adding Syria to its bases of operations. While the Americans focus on their war against insurgents in Iraq and the Israelis are caught up in fighting Palestinian terrorists, al Qaeda is drawing a ring of fire around both. Monday night, April 26, Jordanian TV aired the confessions of captured al Qaeda-linked terrorists, including Syrians, saying they had planned a chemical attack on Jordanian intelligence and US embassy in Amman. 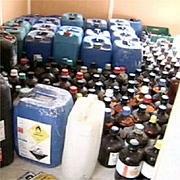 Jordanian security reported trucks seized with 20 tons of toxic chemicals that could have killed 80,000. DEBKAfile reported earlier this month, that this attack was directed equally against targets in Amman and the Adam Bridge gateway from Jordan into Israel. Al Qaeda’s order of action this month shows a certain logic in terrorist terms: first, the chemical weapons attack that was foiled by Jordan, followed by the bombing of Saudi General Intelligence headquarters that wrecked the kingdom’s counter-terror nerve center in Riyadh, then the homicidal speedboat bombers that aimed to sever Iraq’s main oil exporting route at Basra offshore terminal and, three days later, the attack on foreign missions in Damascus, including UN offices and the Canadian embassy. The sound of these blasts was still reverberating around the Syrian capital Tuesday night, when Lakhdar Brahimi, the UN secretary’s special envoy to Iraq, stood before the UN Security Council in New York and emphasized the importance of sticking to the June 30 handover deadline in Iraq. Brahimi is determined to get a caretaker government up and running in Baghdad before that date; Al Qaeda and Iraqi insurgents are equally bent on frustrating his effort. Osama bin Laden’s network in conjunction with Iraqi guerrillas sabotaged the last UN operation in Baghdad when they blew up the mission building on August 19, 2003 and murdered the last UN Iraq envoy Sergio de Mello and 22 UN staffers. 1. The ease with which al Qaeda’s cells and killers pass through borders and move across the Middle East at will, striking from operations centers uncomfortably close to Israel’s borders in Iraq, Iran, Jordan, Saudi Arabia and Syria. 2. It is feared that they will next attempt to infiltrate Israel from several directions at once. Al Qaeda’s new methods were exposed by two earlier events this month - a suicide bombing that destroyed the heavily secured, seven-floor Saudi General Security headquarters on Riyadh’s al-Washm Street on Wednesday, April 21, and the raid a day earlier by Jordanian security forces on a villa in Amman’s affluent Upper Hashami neighborhood. In the second event, the Jordanian squad made two astonishing discoveries. One was that they had seized a section of a terrorist ring bent on a chemical weapons attack. The other was the first Iraqi cell known to be working for al Qaeda. The threat of non-conventional warfare hangs more palpably over the Middle East now than ever before. So too does the very real menace to the royal houses of Saudi Arabia and Jordan. It is now clear that al Qaeda or its surrogates have infiltrated Saudi and Jordanian intelligence and counter-terror agencies to a degree that imperils the two thrones. There is no other way of accounting how two car bombs came close enough to blow up one of the most sensitive anti-terror facilities in the Saudi kingdom and prop of the royal house. The entire city had been on the highest alert for months. This week it reached a new climax after Saudi security intercepted in the Riyadh area five booby-trapped vehicles laden with a total of four tons of explosives. Yet two bomb vehicles drove around the town past roadblocks and security checks without being apprehended. The Saudis were as usual intent on minimizing the damage, claiming four dead and 148 injured when the true death toll stood at 24 and 250 wounded. But they could not disguise the first time that al Qaeda has directly attacked a Saudi security target and personnel charged with protecting the royal family, after a series of bombings against foreigners in the kingdom. Indeed most of the casualties were members of Saudi security forces. DEBKA-Net-Weekly quotes counter-terrorism experts as asking how the bombers penetrated the security barriers of the heavily fortified General Security building – not once but twice. They drove up to the barriers without being stopped one hour before the blast and engaged the guards in casual conversation on the working hours in the building. They then turned around and came back an hour later. Seeing hundreds of workers heading out of the facility at the end of the workday, they crashed a barrier and blew themselves up in the packed parking lot adjacent to one of Riyadh’s busiest streets. The suicide bombers’ freedom to move around a jittery capital without being challenged, the readiness of the guards at a highly sensitive facility to reveal such information as working hours are only two anomalies that indicate that some high-up in the Saudi security service must have cleared the way for them to reach their target. The incident in Jordan was still more revealing. The Upper Hashami estate, home to some of the wealthiest families in the Hashemite Kingdom, is tightly secured by a private firm, Jordanian security personnel and police officers. Visitors must show identification before they are allowed in. A fence surrounds the neighborhood’s opulent villas and its guards carry state of the art electronic monitoring equipment. No one goes in or out without the knowledge of Jordanian security. Certainly anyone seeking to rent a villa is thoroughly vetted. Nonetheless, al Qaeda was able to rent a villa for eight to 10 terrorists, at least seven of them recent arrivals from Iraq. All were highly trained in chemical warfare. Yet security personnel in Upper Hashami saw nothing amiss in a bunch of terrorists living it up in the posh suburb and armed to the teeth at all times. By good fortune, a neighbor who found their presence odd telephoned Jordanian security authorities, who immediately acted on the information. But was Jordanian security really taken by surprise? Did some high-placed al Qaeda plant make sure that the service tasked with guarding the throne was kept ignorant? The grave breach discovered in his capital and his security and intelligence services was the real reason why King Abdullah called off his trip to Washington at the last minute, rather than affront at what his spokesmen claimed was President George W. Bush’s retraction of the Middle East “road map.” The Jordanian monarch could not afford to delegate this crisis to anyone but himself. Massive suicide car bomb explosion kills 6 Iraqis and one US soldier, injures 24 on Tigris bridge entrance to US-led administration headquarters in central Baghdad. The car detonated as people lined up for work in compound, damaged 10 vehicles. In Baquba north of Baghdad, two bombs destroyed Talabani's PUK HQ, injuring four. Two Hizballah bands' attempt to raid Israeli Hard Dov "Gladiola" position on Lebanese border repelled by Israeli fire before dawn Thursday. One band carried heavy loads. Wednesday, Hizballah cross-border shelling elicited Israeli warning to Beirut to impose authority in south. US offensive against Sadr militia continues in two southern Iraqi towns. Three US troops killed Wednesday in clashes during raid of Sadr’s offices in Diwaniya. Fourth US soldier and at least 24 Iraqis killed in ongoing battle between coalition and Sadrist militiamen in Karbala. Fifth US troop slain at roadblock on road into southern Baghdad. Bush vows in interviews to 2 Al Arabiya and Al Hurrah Arabic TV stations: Any US soldiers who abused Iraqi prisoners will be punished. In interviews to quell ME outrage over "abhorrent" photos, Bush said: Americans just as appalled by images as Iraqis. An open society investigates and corrects mistakes. Israeli woman driver injured by Palestinian gunfire on north West Bank road between Peduel and Alei Zahav. Some Bush administration members say Syria has centrifuges to enrich uranium for bombs. Report disputed by some parts of US intelligence comes amid mounting pressure in Washington to clamp sanctions down on Syria. Several Western diplomats in Vienna certain Syria was customer of Khan, Pakistani nuclear secrets black marketeer. Saudi ruler Abdullah blamed al Qaeda’s Yanbu oil refinery attack Saturday on “Zionist enemies”. To divert attention from Damascus terror attack, Syrian propaganda machine concocted a Mossad assassination plot against Hamas leader Mashaal. MARKETPLACE’s prestigious MIDDAY REPORT ran a three-minute feature on DEBKAfile by Adam Davidson. Copyright 2000-2004 DEBKAfile. All Rights Reserved.